After three crit­i­cal­ly-acclaimed albums (and two ear­ly self-released LPs), Joan­na New­som released her newest album, Have One on Me on the 23rd. Have One on Me com­bines the best parts of Newsom’s ear­li­er albums with some new cre­ative and musi­cal twists. It’s at the same time Newsom’s longest album and her best album over­all - she’s tak­en her immense cre­ativ­i­ty and applied it to a huge num­ber of con­cepts to cre­ate just over two hours of immense­ly inter­est­ing music. As such, Have One on Me is noth­ing short of excel­lent. 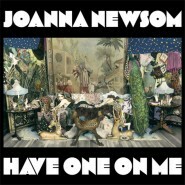 Have One on Me makes good use of the famil­iar sound of Newsom’s harp, whether com­bined with a vari­ety of instru­men­tals for the rich sound found on “Have One on Me” or left alone with Newsom’s voice for the spars­er (and yet incred­i­bly reward­ing) sound New­som has proven her­self to be so good at cre­at­ing. The sweep­ing, rhyth­mic sound which this pro­vides to the album cre­ates a sort of seren­i­ty which con­trasts beau­ti­ful­ly with Newsom’s occa­sion­al­ly sur­pris­ing vocal twists and turns. With Have One on Me’s eigh­teen tracks, New­som uses a wide vari­ety of instru­men­tal approach­es to cre­ate songs that are rec­og­niz­ably hers, with­out ever slip­ping into rep­e­ti­tion or bor­ing the lis­ten­er. There are dis­tinc­tive vocal­ists - and then there’s Joan­na New­som, whose unique vocal style is often the main focus of any exam­i­na­tion of her music. Newsom’s style is del­i­cate with a care­ful­ly con­sid­ered com­plex­i­ty, inno­cent with­out seem­ing child­ish, and always just strange enough to intrigue a listener’s ear with­out slip­ping into abstrac­tion. Along with her vocal style, New­som uses a sin­gu­lar pat­tern of inflec­tion which makes every word quirk­i­ly melod­ic - it’s jar­ring when it needs to be, but for the most part it allows Newsom’s music to flow at the pace she choos­es, how­ev­er nor­mal or strange that may be. New­som is most fond of telling sto­ries filled with some­times odd but always bril­liant­ly clear imagery, and she’s done just that on Have One on Me. Pic­tures like “a brace of jackrab­bits / With their necks all broke” con­trast sharply with the “par­a­lyzed daisy” of “Easy,” but New­som uses both to paint the fan­tas­tic pic­tures that stream through Have One on Me. There are occa­sion­al ref­er­ences to real­i­ty (often his­to­ry) in Newsom’s sto­ry, most notably “Have One on Me” itself, which quite col­or­ful­ly tells the sto­ry of Lola Mon­tez, Count­ess of Lands­feld. As such, though Have One on Me is cer­tain­ly inter­est­ing sim­ply through its musi­cal ele­ments, with the addi­tion of Newsom’s cre­ative way of sto­ry­telling, it becomes tru­ly com­pelling.